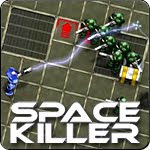 A futuristic shoot 'em up. Stop the spaceship from reaching it's destination. Follow your commander's instructions. The more enemies you kill the more powerful your equipped weapon will become. It loses power as you are hit.